Where do Elephants Live in Asia? The Harsh Reality for Temple Elephants. I have never had to put a warning before. I just wish to acknowledge that some of the content below is confronting and may be shocking for you to read or see. I do urge you to continue reading and let’s help save the Asian elephant together! 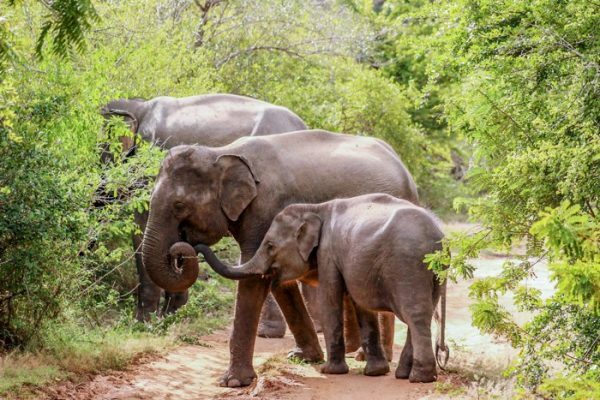 It is not all depressing content and I will show you how to experience magical moments with wild Asian elephants soon: in a series on Sri Lankan national parks. Wild elephants in Yala National Park. Elephants, for me, epitomise the beauty of the family bond. The matriarch of the herd is in charge and will protect any younger elephants. I guess given my current situation, I can relate! The herd will literally surround an elephant calf if a threat is near. Elephants are also emotional creatures, again I can relate! Elephants feel joy when they are reunited with other herd members. They even feel sorrow when a herd member has died. As humans, I think we massively underestimate the emotional welfare of many animal species, elephants included. The Asian elephant Elephas maximus has been on the endangered list since 1986. Elephas maximus maximus is a recognised subspecies found in Sri Lanka. It is one of three subspecies of Asian elephant. Over the last generation, the elephant population has rapidly fallen from 12,000 to an estimated 2000-3000 wild elephants. It is a sad tale that is unfortunately repeated in many Asian countries and without action, the Asian elephant is in real trouble of being lost forever. Save the Asian Elephants is a wonderful organisation aiming to do as their name suggests! Family Bites Travel above all else wants to ensure we have ethical travel experiences. Whilst travelling around Asia, and specifically Sri Lanka, it is clear how important elephants are to the people. We have seen captive elephants and that has left us saddened. We have seen some very shocking housing condition and evidence of ill-treatment. 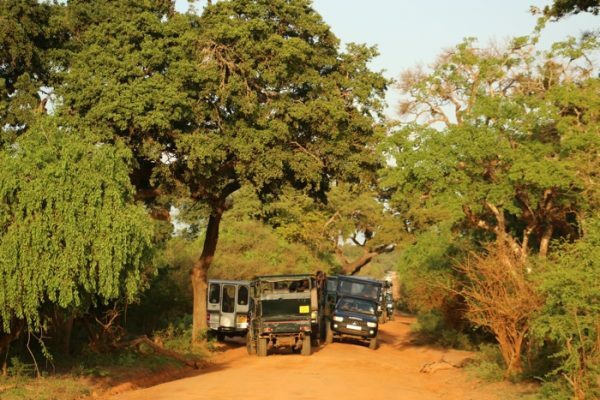 Yet refreshingly, we have experienced some magical moments on safari seeing wild elephants in Yala and Udawalawe National Parks in southern Sri Lanka. Elephants in Sri Lanka have been closely aligned with the country’s religion and culture for over 2000 years. I’ve observed how Sri Lankans clearly love to see elephants. We attended a religious procession through the streets. It had many temple elephants dressed up and they looked quite grand. But the massive amount of chains and ever present goad didn’t make this a happy event to witness. 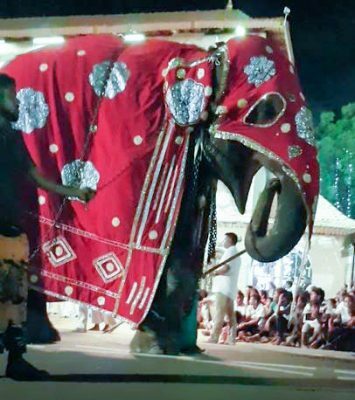 Prior to the procession, the elephants were chained within the temple grounds. They all swayed from side to side showing classical signs of extreme stress. These repetitive movements are seen in many captive animals that are exposed to very unnatural surroundings. 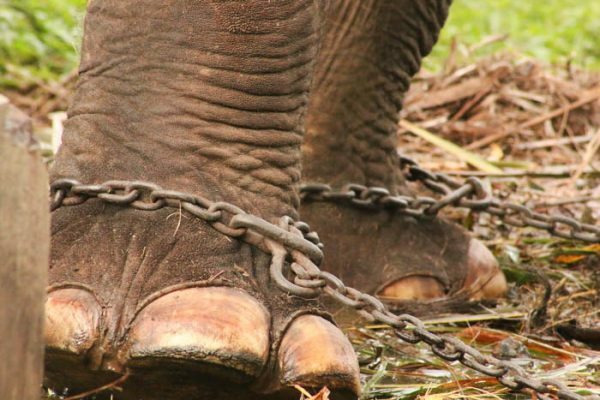 Life in Chains: All 4 legs are chained meaning the elephant cannot even move its legs. During this ceremony, around ten to twelve male elephants were paraded through the streets. 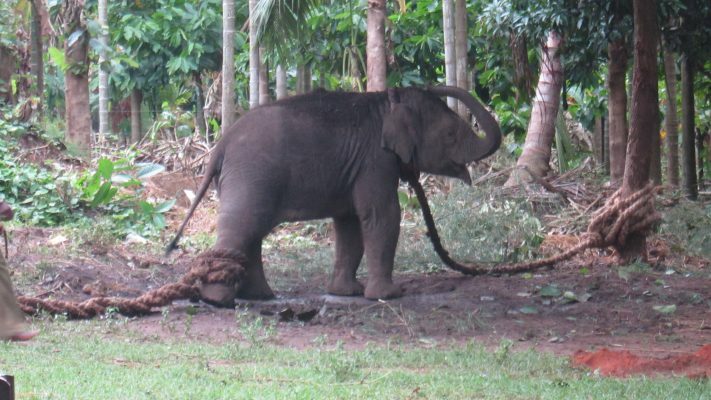 All the elephants were heavily chained but one elephant, in particular, was extremely agitated and distressed from being poked with a bullhook rod by its Mahout (elephant handler). This particular elephant was swaying even as he walked. I was told, “look he is dancing!” If this is what people believe, education and legislation is key to making a change in people’s mindsets. These elephants are not dancing. They are under extreme stress and exhibiting it by these repetitive movements. I was really enjoying watching the dancing of the humans between the sad elephants moments. Each time another elephant came out, my heart sank. The moment I wanted to just break down and cry came when a tusker came out. He was not the smallest, nor the largest elephant. I noticed him as he stood in front of us for some time. Then my heart broke as I realised he was sucking on his own tusk. It reminded me of Mali, “the loneliest elephant in the world” who holds her own tail. A still from my footage of this elephant sucking his own tusk. Although the numbers are not accurately recorded it is estimated that there are around 250 captive elephants in Sri Lanka. I can never forget the sight of a very sad old tusker in Sri Lanka who had a gouging wound where chains were cutting into his leg. The wound was trying to heal AROUND the chains, and his mahouts had sprayed some “green antiseptic” spray on it. It was infected. I was really angry. The poor guy was just swaying, a chain on each leg, bleeding from the leg and had a very fresh wound on his face. I rechecked him a few weeks later, I was glad they had removed the chain from the leg but the removal of that one chain showed how many times this must have happened to this tusker. He had rings of scar tissue up his leg. He had one chain removed yet he still had his 3 other legs shackled. The chain length was so restrictive, he could not move forward or move back with these 3 legs, let alone lay down. He was clearly distressed with limited shade, no water, and no food. He had one lowly palm frond that he was picking up and using to shoo the flies. He was bored witless. Death would be welcome. Leg wound with embedded chains. Note the “green spray”. A chain on each leg, no shelter, food or water. Chains are tethered so tightly the elephant cannot move. I will talk about elephant training methods in more detail later but one thing that horrifies me is seeing a Mahout using “the hook” when handling an elephant. 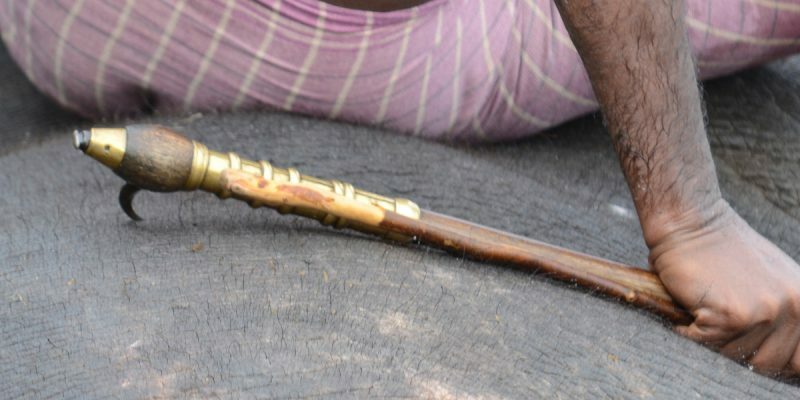 The hook is known by many names; bullhook, goad, anku or ankusha and in Sri Lanka, it is called an ankus. Irrespective of the name or the physical shape, it’s an instrument used to instill fear and to inflict pain. This was the reason it was being used on that distressed elephant I saw at the street parade. Known by many names, this is an instrument to inflict pain. During the entire procession, I was utterly terrified one of the elephants was going to go rogue and trample us to death. Who could blame them?! Elephants are sensitive souls being put into very unnatural and loud precessions covered in bright lights! It was scary to be at ground level with a massive elephant a mere metre away. In June a man was killed at a Buddhist street procession and this is not an isolated incident. Fear instilled into these animals means ‘control’ for the mahout. Bright lights and loud sounds. 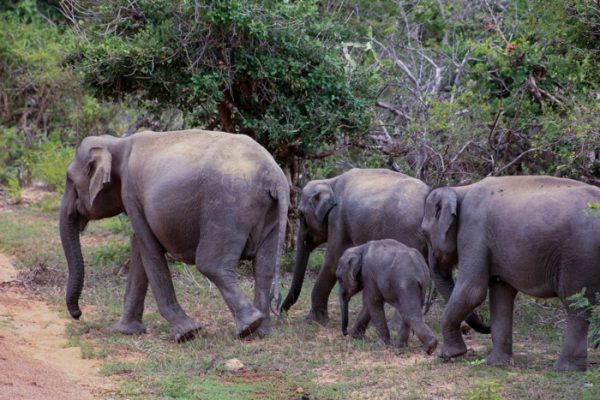 In Sri Lanka, the number one issue elephants face is human-animal conflict over land. The people need to farm and the elephants need to eat. 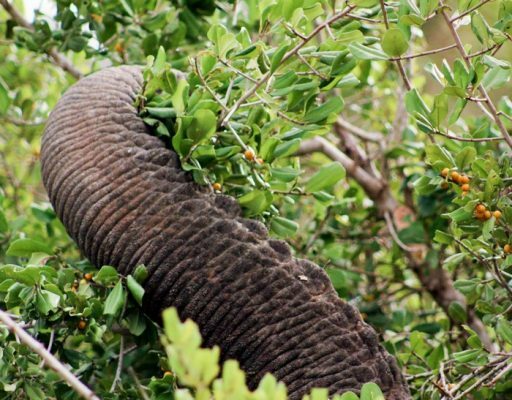 Although land use is the main issue elephants face, they also must battle poaching. Each year over 250+ elephants will be killed. We visited an elephant orphanage, the “Elephant Transit Home, near Udawalawe national park and it was sad to see the number of calves there. Although, far from perfect, at least any sick or orphaned elephants have somewhere to go. This organisation has also successfully released elephants back into the wild. There is another more famous orphanage in Sri Lanka called Pinnawala that I cannot with all good consciousness visit. They allow riding for a start. Secondly, the elephants are chained for very large amounts of time and forced to lay down to “enjoy” a wash from a tourist. Further, they have been involved in some very underhanded trading of elephants. Sometimes a business ‘sanctuary’ or ‘orphanage’ are the words used but the venture is purely financial. Elephants must consume 150kg of food per day! Conflict is not a one-way street, as many people also lose their lives from ‘rogue elephants. I have read about 5 people being killed in the 2 months we have been here. It is not surprising when I recently discovered that the brand new road near Hambantota airport was built directly through an important elephant land-corridor! People cannot even drive on the road at night for fear of being attacked by elephants. They even have elephants on the now abandoned international airport. The lack of foresight and infrastructure planning seems utterly ridiculous when you write it down! Even the international cricket ground had to be recently “guarded” to keep the wild elephants off the pitch! 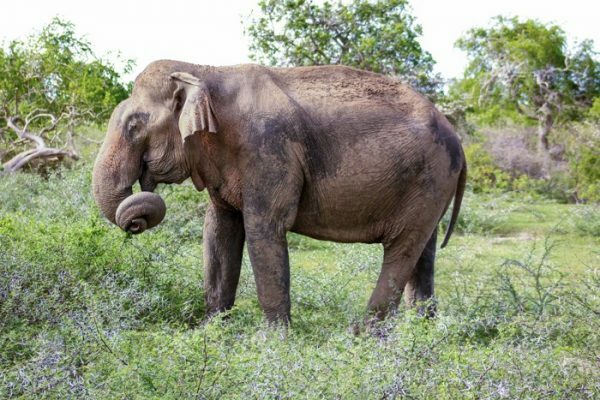 Habitat destruction and human–elephant conflict play a big part in the demise of the Asian elephant in Sri Lanka. But the public often doesn’t realise that the ‘behind the scenes’ cruelty of the elephant tourism industry plays a huge part in Asian elephants’ suffering and demise too. It’s an unregulated industry that causes ill health, a decline in breeding and early deaths of elephants. 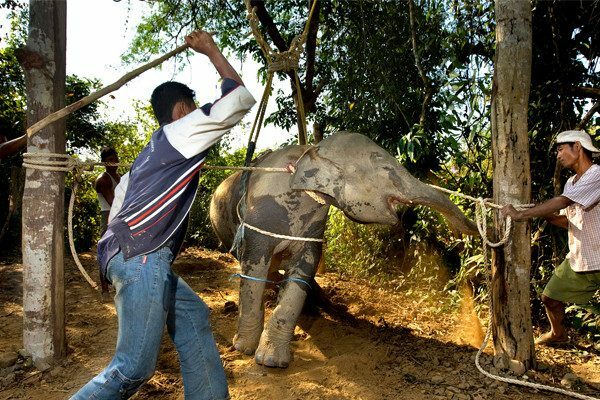 The unnatural, brutal captivity and commercial exploitation of elephants under the guise of religious ceremonies or ‘fun’ elephant rides is the dark side of tourists’ exotic holidays. Temple elephant with a facial wound. Founder of the campaigning charity Save the Asian Elephants (STAE) Duncan McNair explains how elephants are captured and put through a brutal ‘training’ process called ‘pajan’ to break elephants’ spirits to facilitate their use in tourist attractions, festivals and religious ceremonies like the one I witnessed. “Training” a baby elephant includes brutal beatings. If the elephant’s struggle to be free is relinquished and its spirit broken it becomes an obedient slave for life. If not, it will be maimed for life or even beaten to death. The bad news is, whilst capturing baby elephants is illegal, since the new government has come into power the unregulated selling and buying of baby elephants is endemic once again. 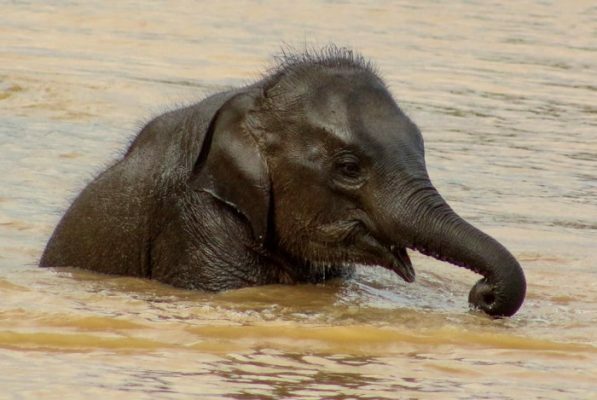 Baby elephants can sell for as much as $125,000. Often the elephant calves are brutally beaten for so long they simply collapse. Many die. It’s hard to imagine that the colourful, exciting street festivities, with elephants ironically dressed up as if they are revered, could have this dark secret. But ask yourself is it natural for a wild animal to be in costume, paraded on a street surrounded by banging drums and jeering crowds? I recommend the documentary Gods in Shackles by Sangita Iyer, which details further the torment that occurs in the name of religious celebrations. When the opportunity arose to collaborate with an organisation such as Save the Asia Elephants (STAE) I jumped at it. STAE’s board is impressive. It is made up of leading conservationists such as Ian Redmond OBE and Stanley Johnson and other passionate elephant advocates. Often you can see something is wrong but feel there is nothing you can do about it. Here I can use my platform and voice to help to Save the Asian Elephants. I was hoping I could simply say “do not ride elephants” instead “visit the national parks”. Once we visited the national parks it was clear that is not enough! There are some very unsettling behaviours occurring, particularly in Yala National Parks. 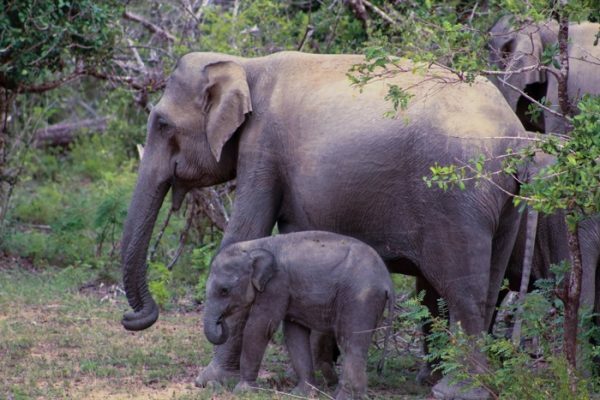 I will show you how you can be respectful and see some magical elephant moments in Sri Lanka. We, as visitors, must push for change. I will in the future show you the best way to see elephants (and other animals) in the Sri Lankan parks. I also want to highlight why riding an elephant is one of the most unethical things you can do whilst in Asia. But for now, I would say at a very minimum of what you are doing it should meet the “gut test”. In your gut do you feel you are contributing positively to this animal’s existence? If the answer is “no”, stop and better yet, let others know it is unethical. This beautiful bull elephant was peacefully eating. He was a sight to behold. No chains. Free. As visitors to another country, I would seldom say we should impose our “Western ideals” onto another culture. In this case, though, and whenever education can help change cruel, outdated activities, it’s simply not good enough to “do as the locals do”. We may not be able to change deeply held beliefs overnight but at the very least we must not encourage or contribute further to an unacceptable behaviour or activity. Case in point – elephant riding! I will talk about this further in due course, for now, I want to talk about how we can help the Asian elephant and we can do it right. 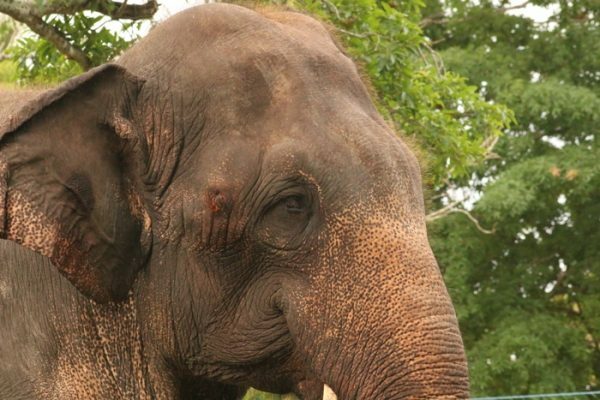 How you can help the Asian Elephant, right NOW! If you want to help raise awareness of the barbaric practices behind elephant tourism and to make a change then support STAE’s work. Visit STAE’s website, which tells you how to help stop the lifelong abuse of Asian elephants in the name of ignorant tourism. 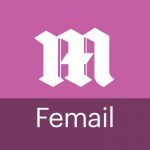 Sign their petition or write to Government representatives in India, Sri Lanka and the UK to move the process along to make a lasting legislative impact. Until proper systems are in place, I support STAE’s position pleading with people to boycott elephant tourist attractions, unless they are proven genuine sanctuaries that respect and protect Asia’s remaining elephants. A beautiful sight in Yala National Park. 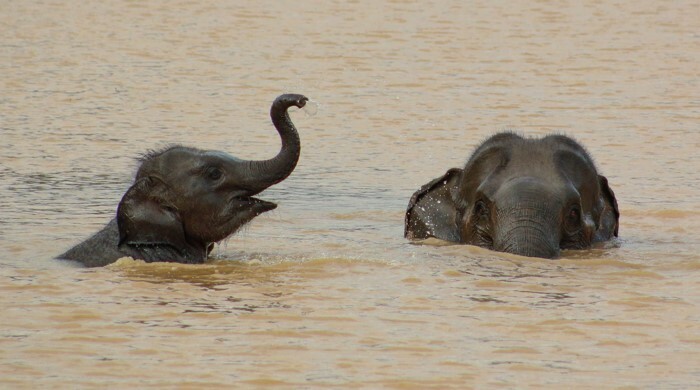 Calf and mother playing in the water. We can make a real difference; doing nothing is unacceptable. You can help protect these beautiful creatures from further pain and suffering. What are you waiting for? Let’s do this together!